During our recent vacation on the French Riviera, my husband and I decided to rent a car and drive to Bandol which is located about an hour down the coast from where we were staying in Cannes. Bandol is one of Provence's oldest wine growing regions and is considered by many to be the most important AOC in the area especially when looking at the Mourvedre-based red wines. The region is known for its terraced vineyards called restanques built from the local river stone. The climate is Mediterranean as the region lies close to the sea with long sunlight hours. The Mistral winds and mountain breezes protect the grapes from rot and cool things down at night. I was interested in visiting Domaine La Suffrene as it is very available in the Houston market. Winemaker Cedric Gravier took over his grandfather's business in 1996 and when he heard that I was in town, he was kind enough to show up himself to taste with me and give me a tour of his winery and cellars. 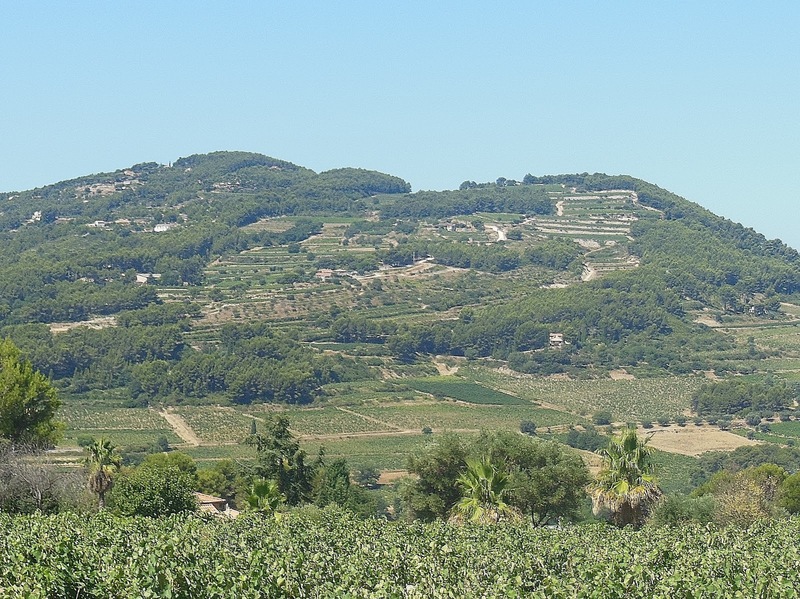 Domaine La Suffrene is one of the top five producers in Bandol. The vineyard area has approximately 125 acres between La Cadiere d'Azur and Castellet with a majority of old vine Mourvedre, Grenache and Cinsault though he also has small amounts of Carignan and Syrah as well as some young vine Clairette and Ugni Blanc. The soils in his vineyard are comprised of sand, silt, limestone chalk and clay. Cedric was expecting harvest to begin in September based on the current state of the maturity of his grapes. All the grapes are hand harvested in bunches and then are sorted twice, once in the trailer and again at the wine cellar. 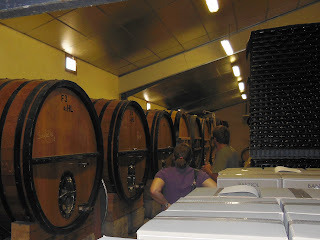 We tasted the 2011 Blanc first which is 75% Clairette and 25% Ugni Blanc. The vinification method involves low temperature fermentation with grape skin maceration and the blocking of malo-lactic fermentation. This technique creates a smooth, yet crisp mineral driven white wine with a light herbal character. The 2011 Rosé was up next which is a blend of 40% Mourvedre, 30% Cinsault, 20% Grenache and 10 % Carignan. This was a fuller body Rosé with nice acidity and flavors of fresh berries and apricot. We followed this with his special selection 2007 Rosé "Cuvée Sainte Catherine". This wine is only made in certain years and is a blend of 95% Mourvedre and 5% Carignan. Almost five years old, it was a bit more structured with significantly less fruit, more minerality and a bit more earthy character than the prior wine. We then tasted through a few vintages of the Rouge starting with the current 2009 release then going back in time through 2006 and 2003. The blend was made up of 55% Mourvedre, 20% Grenache, 15% Cinsault and 10% Carignan which is aged for 18 months in large old oak barrels without fining or filtering. The result is a firmly structured, rich, spicy, ripe black fruit flavored wine with a light earthy character. Cedric also poured his special Rouge the 2009 "Cuvée Les Lauves" followed by the 2000 vintage allowing us again to see how his wines progress over time. The blend on the Rouge Cuvée is 95% Mourvedre and 5% Carignan which is also aged for at least 18 months in large old oak barrels and bottled without fining or filtering. These two wines showed heavier spice, licorice and a bit more of the earthy component. The wines became smoother and more complex with an additional savory character as we journeyed back through past vintages yet still remained fresh and flavorful attesting to the age ability of Bandol's red wines. All of the wines were absolutely fantastic and some of the best of Bandol that I have tasted both during our vacation and here at home when compared to others I have found in the Houston market. The winery/cellar is a modern air conditioned facility with temperature controlled stainless steel and concrete tanks for fermentation, an isothermal tank for debourbeage and numerous large oak barrels in a variety of ages for the maturation of the different wines. Cedric's passion for what he is doing is undeniable and it is exciting to imagine the future of the wines of Domaine La Suffrene. This line of wines from Bandol is definitely worth seeking out in the Houston market. I will be writing more about Bandol in my next posting.